Even if it didn't include a cover of Guns n Roses epic song "Estranged," we'd be impossibly intrigued by Droneflower's debut album. Droneflower is the pairing of folk/dream pop artist Melissa Nadler and Stephen Brodsky of metalcore bands like Cave In and Mutoid Man. It's not a pairing I ever thought we'd see, but the two became friends when Brodsky went to see Nadler on tour, which lead to the formation of Droneflower. For their cover of "Estranged," Droneflower cut the song down by two minutes. It still clocks in at over seven minutes, so they kept most of the epic scope. It leans more towards Nadler's artistic output than it does Cave In. It's haunting folk, but there is more of an edge and noise lingering than you might expect. It's folk with an unexpected menace and droning guitars. This is such an interesting pairing, and we can't wait to hear more. You can listen to Droneflower's cover of "Estranged" below. Droneflower's self-titled debut album will be available on April 26. You can pre-order a copy on Bandcamp. 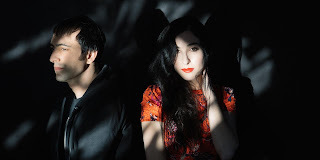 For more on Droneflower, check out Marissa Nadler's website. Olden Yolk - "Distant Episode"
Merival - "I With Mine"
Lucy Dacus - "My Mother & I"
4 More Bands Announced for Green River Festival! Sarah Bethe Nelson - "Paralyzed Waltz"